It is difficult to find another surgical procedure as simple as vasectomy that has sparked so much medical and social controversies for more than a century. The history of this procedure is a combination of finding the most ideal technique and the best results but also filled with misconceptions, false beliefs and incorrect indications. 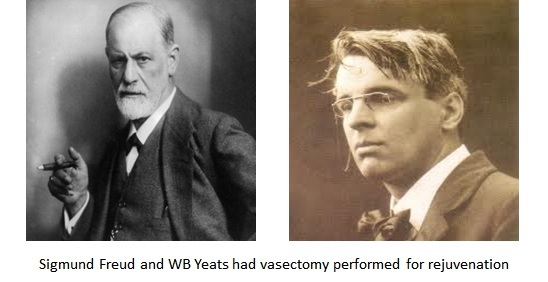 Vasectomy has a long and interesting history. The term vasectomy means an excision of the vas deferens. In Latin, vas means vessel and deferre means to carry down. As a medical term, vasectomy is somewhat misapplied because only part of the vas deferens is excised during the procedure. Vas deferens as an anatomic structure was not a subject of significant clinical and research interest until the nineteenth century. New techniques continue to appear for vasectomies. In 1967 a new technique is introduced in India by Kothari and Pardanani. They demonstrated that it’s possible to produce a sub fertile sperm count by using a synthetic thread to temporarily obstruct the vas deferens. Removing it would restore fertility. Based on two cases the thread was left in for 20 weeks and 6 weeks later fertility had returned to previous levels. No-scalpel vasectomy was developed in China in 1974 by Dr. Li Shungiang of Chongqing Family Planning Research Institute, Sichuan province. Tubal ligation was the most commonly used method of voluntary sterilization. Vasectomy was not popular with Chinese men. The new technique was minimally invasive with a much lower complication than the conventional method. Dr. Shu has performed no scalpel vasectomy for 15 years. He invented two-finger technique in facilitating the local anesthesia and holding the vas during the surgery. In 2008, Dr. Steven Shu opened his own clinic, One Stop Medical Center in Edina and Shoreview, MN which is focused on in-office procedures including no-scalpel vasectomy. In 2009 Dr. Steven Shu also adds the “no needle” vasectomy. The clinic has been doing many more vasectomies every year after the procedure-oriented clinic gained more reputation and became the number one vasectomy clinic in Minnesota. Dr. Shu was an assistant professor in the University of Minnesota medical school from 2006 to 2012, teaching no scalpel vasectomy and other office procedures.